GENERA - Gender Equality Network in the European Research Area - is a project funded by the European Commission under GERI-4-2014 01 September 2015 - 31 August 2018 grant agreement 665637. GENERA is a Horizon 2020 project aiming at continuing, monitoring and improving the Gender Equality Plans of Research Institutions and Organisations specifically in the physics research field. These three actions will be performed by a Consortium of 13 beneficiary partner Research Performing and Research Funding Organisations and a number of associate partners and observers. 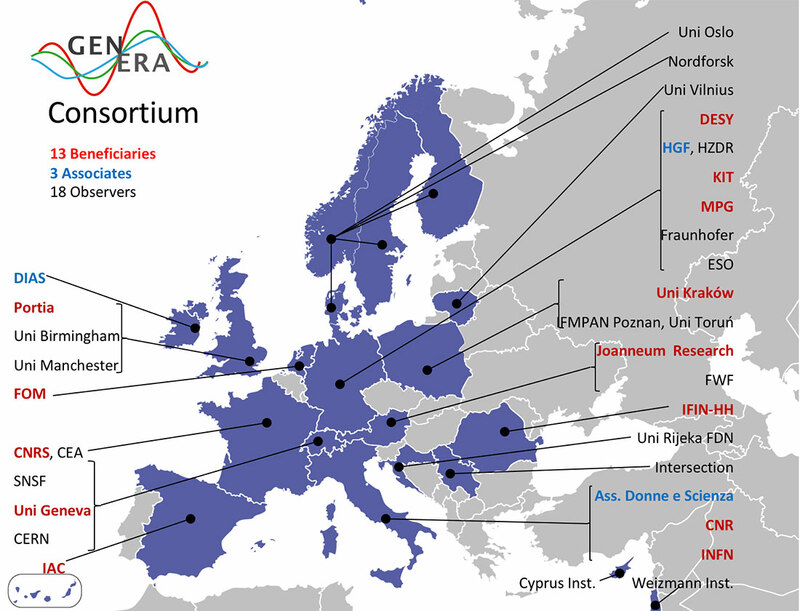 The GENERA Consortium includes a considerable representation of women physicists active in their careers at different levels and will engage with further women physicists active in various Institutions to benchmark and monitor the effectiveness of already active and previously proposed measures and the ones which will be proposed by the Consortium. The end goal is to propose and create organisational structures allowing physics research in Europe to benefit from the greater presence of talented women at all levels, and which can open up more opportunities for women to create successful careers in physics research and in related fields. While the end goal will focus on the research world, GENERA will look into the origin of the problem by creating liaisons with schools and proposing suitable programs to foster the field from early stages and to propose measures that can be adopted by middle and high schools. Another major goal of GENERA is to contribute to overcoming the under-representation of women in physics research which is long-standing and persistent even if the prevailing cultures adopt the assumption of being ‘gender neutral’. Still, these assumptions did not produce the desired effect of increasing female representation in the physics research field. GENERA will focus on the implementation by European research organisation of Gender Equality Plans customised to circumstances and needs of the physics research community. The customised Gender Equality Plans involve systematic examination of all decision-making processes to identify any possible sources of gender bias in the research organisations active in physics and related fields.